It’s no secret that traditional service marketing is seeing diminishing returns, has become fragmented, and is difficult to track. We continue to use tactics that may have worked 15 years ago while often missing opportunities made possible by innovative technology—and demanded by the way our customers digest media today. Take artificial intelligence (AI), for example. Artificial intelligence has proven its ability in many industries to increase engagement, lower outbound marketing costs, and cut through the clutter of today’s marketing noise. Look in the mirror and consider your strategy and beliefs when it comes to customers. Ask yourself, “Am I personally tired of being marketed to?” If you’re not sure of the answer, think about what you do each time you go to the mailbox and sort the pretty pieces of direct mail, or when you turn on the TV and subconsciously tune out the commercials. Like you, more and more consumers are turning to DVRs, streaming media, and subscription radio to choose their own level of exposure to marketing and advertising. Don’t get me wrong—there is still a place for these mediums. But the trend toward more personalized marketing is undeniable. Therein lies the beauty of high-impact technology such as AI and machine learning: Its ability to scale and repeat in a highly personalized way—at a much lower cost and with measurable, trackable results. For example, leveraging an AI email platform gives you the ability to engage with (have a genuine two-way conversation) up to 40% of your sales and service customers. This is vastly more than with traditional methods, and will increase as your staff understands AI’s benefits and collects more viable email addresses. Compare that 40% with the 1% to 2% return on direct mail or the typical open rate of 20% on mass email campaigns and the answer is simple: Engagement is king—the only way to effectively build retention and increase customer satisfaction. The challenge is even greater on mobile devices, which most consumers now use to open and read emails, then sort them like their physical mailboxes. With one glance, they can instantly identify a marketing email versus a personal message, and act accordingly. 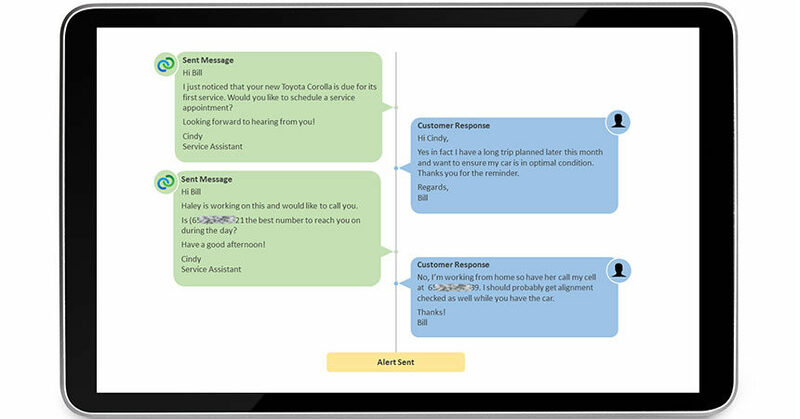 But with AI, the message is perceived as being personal and hand-typed by an actual dealership employee. It is relevant and polite, which delights consumers, who in most cases have never received personal outreach from a service department. The CSI implications are immense: When you prioritize engagement over marketing, you are starting the one-on-one experience with your customers before they set foot in your service drive. With an engagement strategy, you greatly mitigate the need to use marketing expenditure as a Hail Mary to reach customers. In most cases, you can cut your budget in half, yet see better results. And although you still need to pursue customers who don’t have an email on file with traditional snail mail, overall, your budget requirements will decrease significantly. In many cases, the reduction in budget can be reallocated to conquests to add new customers into your service funnel. Deploys in a plug-and-play manner (your staff is involved only when an alert is received). Tirelessly works your DMS one record at a time to find each life-cycle trigger point. Sends the right personal message at the right time. Reads the response from the engaged customer and responds accordingly, without human interaction. Serves up a link to your service scheduler after reading that your customer is ready to schedule service, eliminating the time it would take your staff to reach out. Sends an email or text alert to your staff if further information or human interaction is required. Follows up on each alert with customers to make sure they were attended to in a satisfactory manner. If not, an alert is sent to management. Behaves as a human so your customer never knows that AI is on the other end of the email. Provides analytics that show the sentiment of every customer, how many have engaged by source, how many have fallen through the cracks, and gives a report card of each employee’s satisfaction rating in conveying information back to customers. Exports a CSV to your traditional marketing company, including customer records that lack a viable email or did not engage through the platform to direct that Hail Mary crack at them. The use of artificial intelligence is expected to grow by 93.83% in 2017, according to Statista 2016. We use AI on our phones, in apps, at home, and within vehicles. It’s here to stay, and for good reason: It increases productivity and is extremely cost-effective to use. And best of all, in this application, it leads to a superior customer experience. Did the service department receive the request? Where did the request end up? In a DMS, CRM, or just an inbox? Was the request followed up on, and how long did it take? Were the service request questions answered? Was the response personal or canned? Was there a call to engage or need for a response from your hypothetical customer? If your results are less than ideal, fear not: Most of your competition has the same problem. The good news? Artificial intelligence has the power to automate this area of weakness, and solve the age-old problem of retention and engagement. John Ruble has spent over 20 years helping dealers improve process and embrace technology. He began his career in Detroit selling cars and spent eight years in retail in almost every dealership management position. He is currently director of the ASA fixed ops artificial intelligence service from Conversica. Very good article by John. There are lot of cost savings and revenue generating opportunities that dealers are missing by not embracing AI – Anand Nukala (Omniquo – AI company).